Our craftsmen call the workshop home, by using authentic pieces to source parts, we can help our clients to maximize efficiencies. 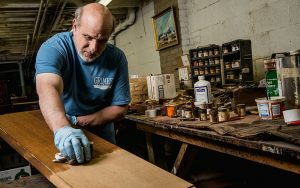 Stocked with every tool necessary for a project and an extensive inventory of antique furniture to use as source material, they work toward the most authentic, faithful furniture restoration possible. We employ the same process of restoration used by the Smithsonian Institute and hold each and every repair project to the highest standards. From broken chair legs to minor dents and scratches, we understand details matter. Our rare expertise brings your furniture back to life. 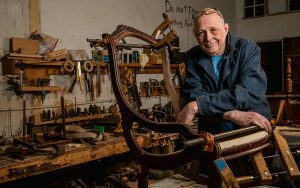 We hand-turn new pieces to match originals and hand-source antique wood from previous eras to repair damaged sections. We don’t believe in shortcuts. The Grimes’ method of restoration is highly technical, thoughtful, and calculated. 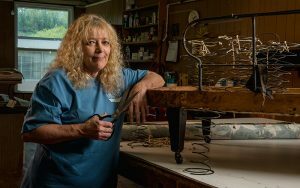 Our upholstery department handles sofas, chairs, and any other textile item that you’d like to bring back to life. Not only will your pieces look great, but they’ll also be structurally sound. After stripping down existing materials, we inspect the frame, make repairs where needed, and even hand-tie and re-spring where necessary. We rebuild your piece to match your custom specifications, including foam density, fabric, and decorative accents. Sometimes all it takes is a fresh finish. From full dining room sets to small side tables, we use a careful multistep refinishing process. To revitalize natural wood colors, we hand-strip each piece with a neutralizer and color controller, and then apply several coats of high-quality stains, sealers, and lacquers.